Years ago, I produced a series of fabric panels that featured artwork from magazine covers of the twenties and thirties. The series was titled, Cover Story. Some of you may have some of these panels. The original kits included a panel and instructions to piece into a wall quilt. Later, the series was re-issued as complete panels with faux pieced borders that required only quilting to finish. 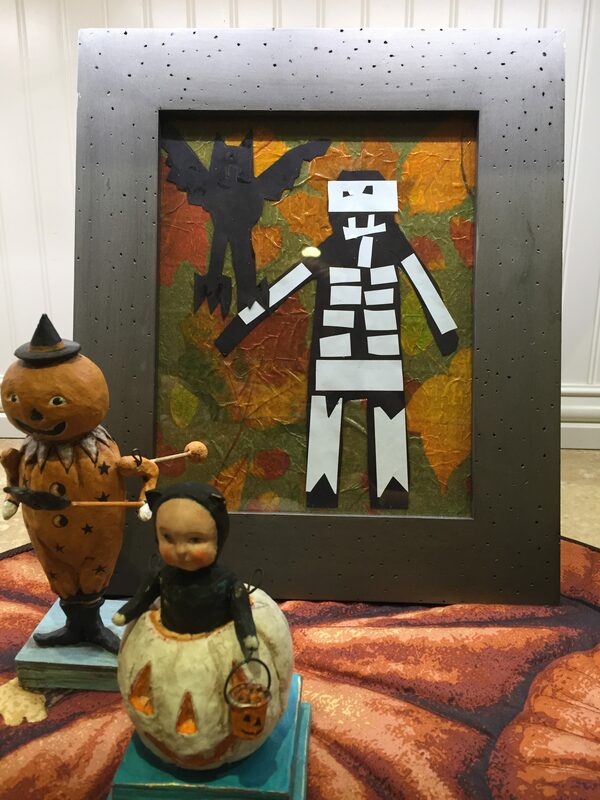 The Pumpkin Boy was always one of my favorites and I had the artwork printed in a very large format and framed. It is the first thing I put up each October. 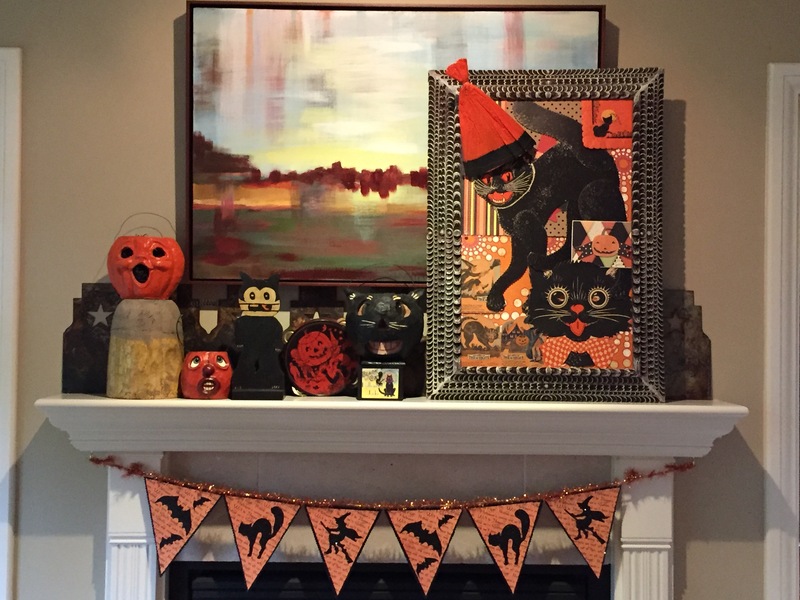 It is always tempting to collect vintage paper Halloween items but pretty difficult to display. I like them best when gathered into a collage which make a great piece of art. This makes much more of a statement than trying to display them individually. This is a collection of paper items I have collected. I started with an interesting old frame and covered cardboard with some orange fabric for the background. It serves as a bulletin board for mounting the items. For the most part the items are slipped under the frame edges and ocassionally a small stick pin was used to anchor the items in place. 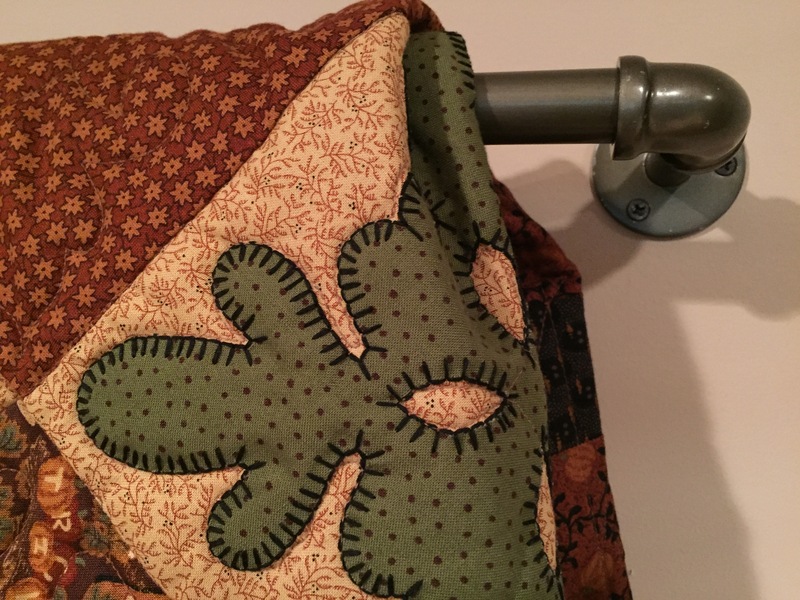 This drapery rod mounted on the wall has been one of the best ways to display quilts. I shared this with you previously but must tell you it is really a handy way to show many quilts grouped together. 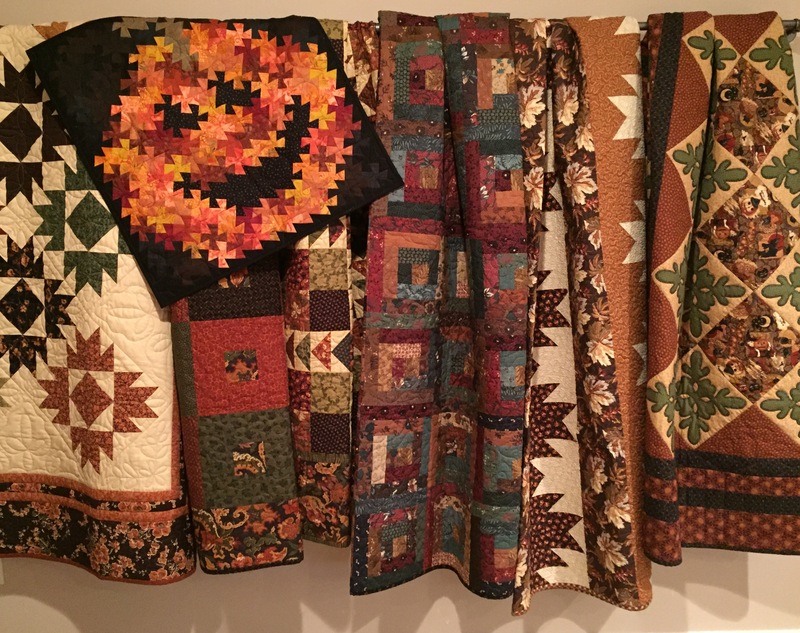 Sometimes I will carefully fold and hang the quilts in an orderly manner but this is probably my favorite way to group them. It is so much fun to see them clustered together rather than folded up and hidden away in a cupboard. I change the group many times throughout the year, generally reflecting the season. I got my rod from West Elm but I see them everywhere. It has an industrial look and is so strong and perfect for the job. But, I am sure any strong rod would do and the great thing is the size can be adjusted to exactly the space you have. Last fall I ran across a picture taken of a barn on the farm where my father grew up. The picture was taken 40+ years ago the day the barn was demolished. I have fond memories of my grandma’s farm and specifically playing in the hayloft. I am one of those people who love old barns and am always drawn to images of them or in a natural rural setting. I am sure that all started in my childhood with grandma’s barn. 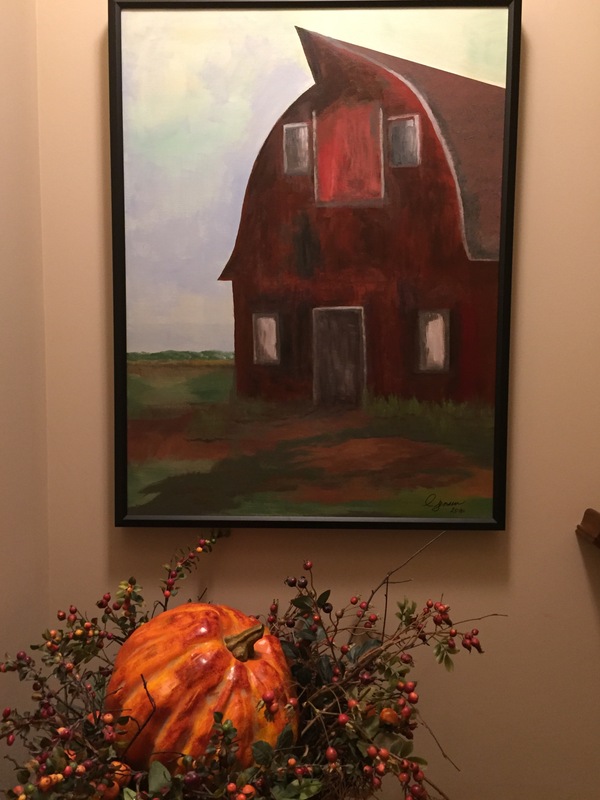 I painted this simple image of the barn, exactly as the photo captured it 40+ years ago and love seeing it each day. One of the best things to do is to repurpose items you already have to create something new. I recently added an antique punch bowl to my collection and went about creating this showy piece for my kitchen island. Years ago I found some orange Christmas ball ornaments at a discount store on sale after Christmas. I had no idea when orange ornaments would ever be used on a Christmas tree, but purchased them at a deep, deep discount (no wonder) thinking I might just be able to use them in the fall. They finally got their chance. I filled the punch bowl with the assortment of orange balls and faux moss balls. I then gathered up some artificial grass, berry and leaf sprigs from my stash and inserted them into the bowl. The ornaments and moss balls held them all in place. I placed the arrangement, surrounded by a fall twig wreath, on a tin cake stand to elevate it, which always makes an arrangement like this pretty outstanding. The best part is, all of the items were in the house and got reused in a new way. 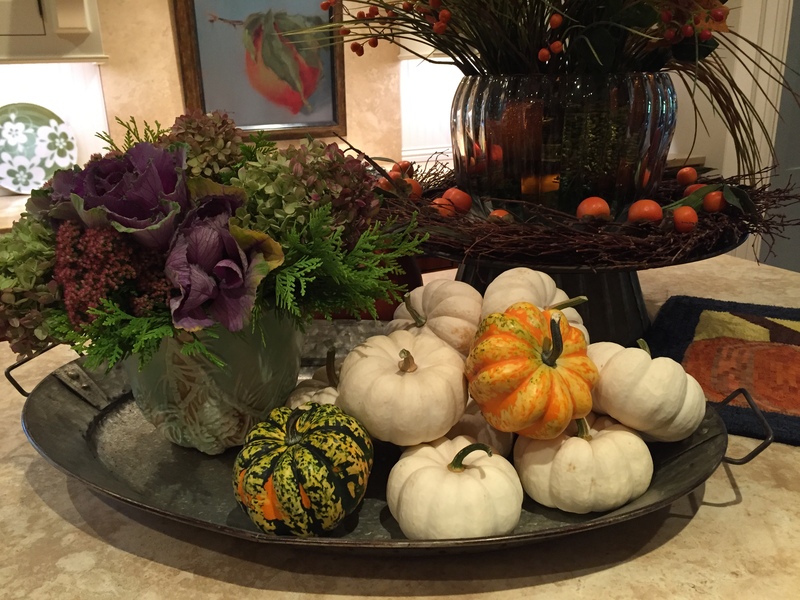 The best thing about fall arrangements is that just about anything goes. Here I collected items from outdoors. It is just about ready to freeze here and kill the plants so it is a good time to bring a few of the fall blooms into the house. 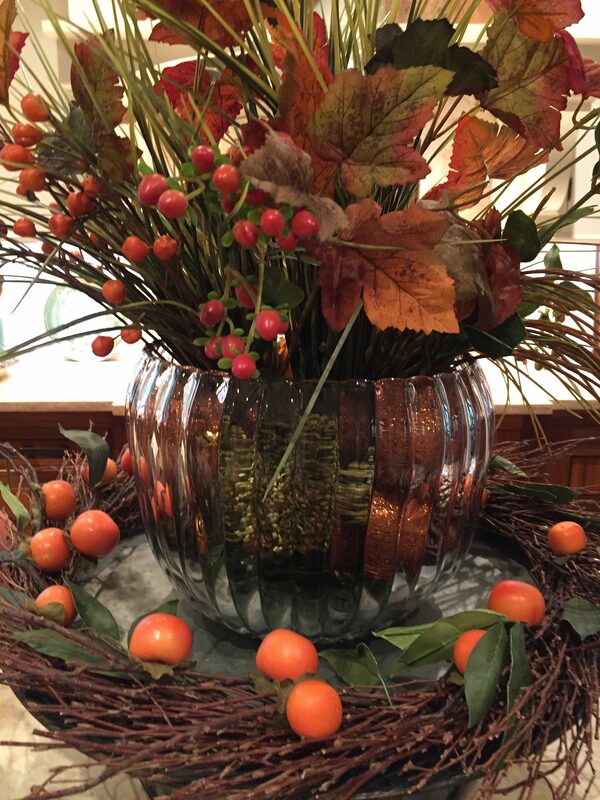 This arrangement is simply Little Lime Hydrangea blossoms with Autumn Joy blooms, ornamental kale and cedar. It will last a long time and here it is grouped with a cluster of white pumpkins and Carnival squash, which is my favorite baking squash. Oh, the colors of fall can’t be beat! I think your orange ornaments are actually “persimmons” and popular around the Christmas holiday season for some cultures. I believe a favorite of Italians. I’ve seen the fruit in markets around that season. Your displays are lovely. You are right…perhaps they are meant to imitate persimmons. However, they are not the shape of the fruit but just the color and lucky for me (great sale price) they didn’t appeal to my area. They do work out nicely for my fall things, however. I look forward to your blog posts each time –no matter what the subject — It all brings back such wonderful memories of my years as a quilt shop owner – You were always such a great inspiration to all my customers and myself. (one of my first) that I taught at for you. So much laughter and fun shared with all of you. Thanks for the note and I am happy you are staying in touch. I love everything you do. Thanks for blogging and sharing all your beautiful things. I have bought your quilt books not only for the patterns but also for the decorating ideas. What an inspiring post with so many creative ideas! I love your barn painting. I grew up on a farm, now 300 miles away. When I visit my hometown, the most emotional moment is seeing the 100+ year old barn as we top a hill. You have captured your barn in such warm colors. 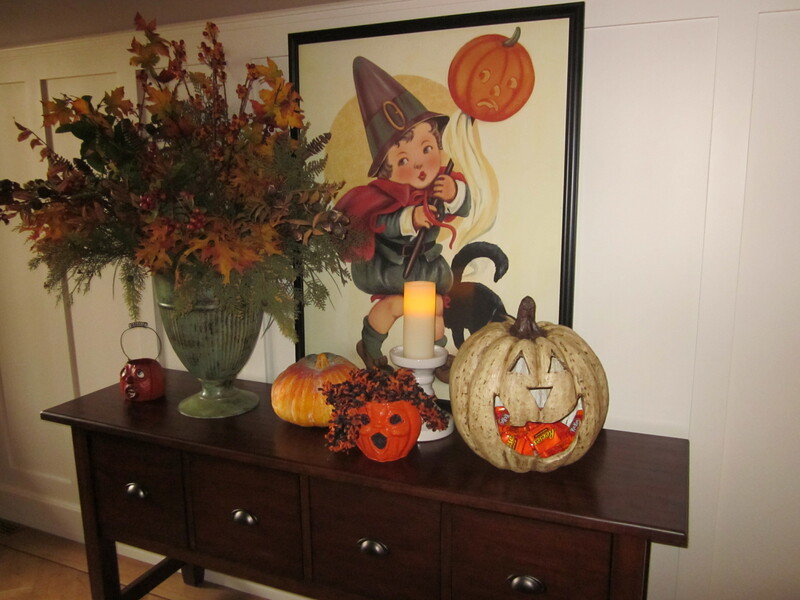 The autumn quilts and decorations are so inspiring. Thanks for taking time to blog. I know…barns are the best! Thanks for sharing your talents with us in your blog. I look forward to reading them and find inspiration in your work. I so look forward to your newsletters! They bring me joy and inspire me! Very sweet collection you have. It was your fall fabrics and quilts that got me quilting in the first place. Love your stuff! Happy trick or treating. I love, love, love, everything you do. Please don’t stop. I’ve copied some of your older patterns by looking at pictures and using patterns in your books. I love pumpkins and leaves. I also love your gardening. Thank you so much for sharing your talents with us. Thanks for a taste of Fall! This is my first visit as a member of the blog roll and it was very enjoyable. Is the pumpkin pillowcover on the drapery rod a tiny pinwheel design? It actually is a little wall quilt and was a gift from two friends, Jackie and Sandy. I think they made it with a special cutting ruler. Perhaps someone who reads my blog will be able to answer this better. The pattern is called “Twister Jack” and uses the lil twister tool. I made one a few years ago. Thanks for the info. I will look for Lil Twister. I look so forward to your posts. Not fond of Halloween as it is so different than our childhoods but you do an amazing job bringing in the beauty that happens this time of year. Thank you. You have brightened my day with your lovely message and beautiful pictures. Thank you for sharing your gifts and talents to bring joy and happiness to others.